Hello friends! Today we are thrilled to bring you a new Sweet Shoppe collection from Heartfelt Creations. I have 2 cards to share with you. The first one is made with the largest cupcake and holds a gift card. Cut a piece of white card stock 5 1/4" x 4 1/4", fold in half. Place the largest cupcake die so that the die extends over the fold so that the fold doesn’t cut. Die cut. Using a sponge dauber, ink around the edge with Aquamarine. 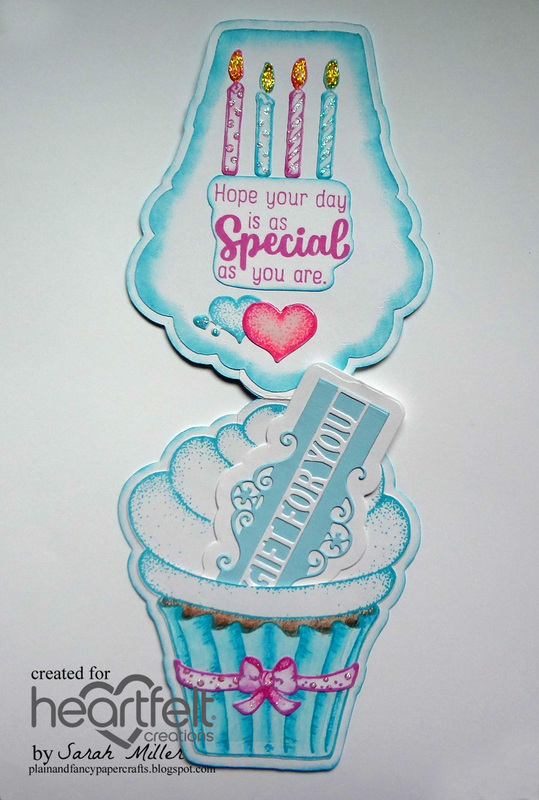 Stamp 2 complete cupcake images on white card stock with Aquamarine. Color the cupcake liner with pencils. Die cut with coordinating die. Stamp only the frosting 3 times; 1 each with Dandelion, Magenta Hue, and Tangelo, sponging with the same inks. Die cut and then layer them on one of the Aquamarine images. Add to the card front. Stamp 2 of the bow/ribbon from the cupcake with Magenta Hue and die cut with coordinating die. Adhere one to the front of the card. Stamp the sprinkles with the same inks on white card stock. Stamp the heart and cherry with Magenta Hue, die cut with coordinating dies and then add glossy accents to the heart and cherry. Add the cherry to the cupcake on the card front. Add the sprinkles. Inside: Using the second image, cut a slit in one of the frosting layers, big enough for the gift card. Glue only around the edges to the card base. Add the bow to the cupcake. Die cut the background layer from the Ornamental Tags die from white card stock. Die cut the second layer from blue card stock. Cut the ‘gift for you’ from white card stock. Layer the 3 pieces together. Slip into the slot made for the gift card. 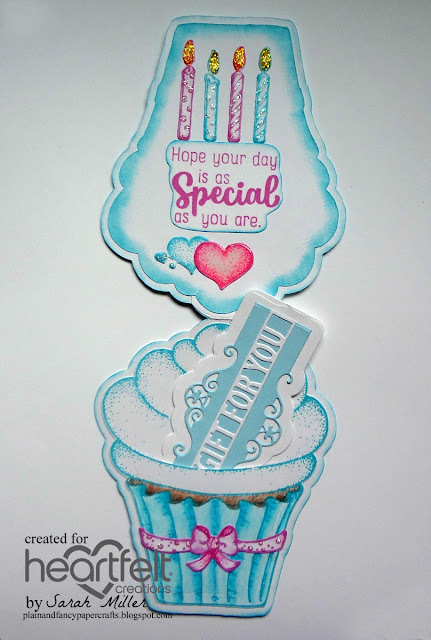 For the top inside: die cut the cupcake without stamping, ink the edge with Aquamarine, and add to the card. Stamp the sentiment on white card stock with Magenta Hue. Hand cut and edge with Aquamarine. Stamp the candles with Aquamarine and Magenta Hue. Die cut with coordinating die and add to card. Use yellow and crystal Stickles. 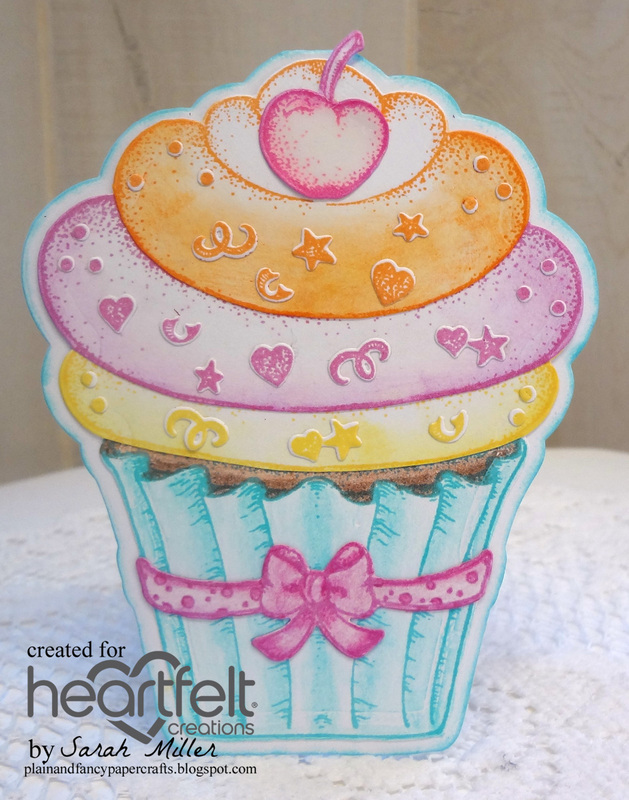 Add heart from sprinkles stamp and pink heart with glossy accents below sentiment. The second card is a very quick and easy card. Cut white card stock 8.5” x 5.5”, fold in half with side fold. Cut black card stock 4 1/8” x 5 3/8”, add to card front. Cut white card stock 4” x 4 7/8”, emboss with dot embossing folder. Die cut largest Ornate Pockets Accent Die from white card stock. Adhere embossed piece to Ornate Pocket Accent, leaving just the bottom edge showing. Adhere to card front. Stamp cupcake twice on blue card stock, twice on brown, once on yellow, and once on pink card stock with Jet Black. Color the cherries and shade the cupcake liners with pencils. Color the hearts with red glitter gel pen. Die cut cupcakes with coordinating die. Cut out the brown pieces as shown and the pink and 1 blue frosting by hand. Paper piece and add glossy accents to cherries. 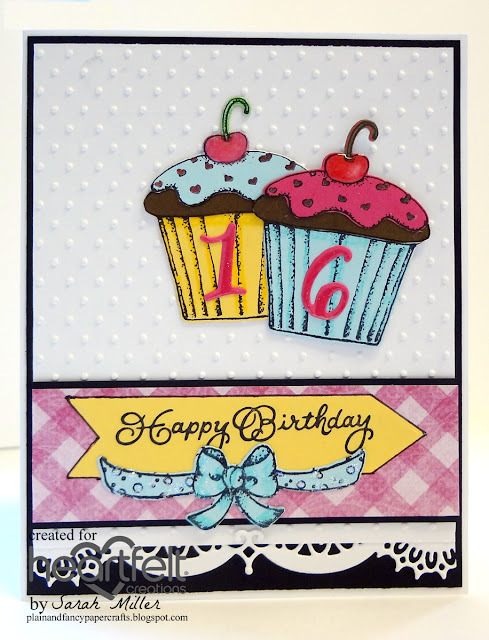 Add yellow cupcake to card and then add blue cupcake with foam tape. Cut a piece of black card stock 1 3/8” x 4”. Cut a piece of pink plaid design paper 1 1/4" x 4”, add to black piece. Stamp sentiment on yellow card stock with Jet Black. Die cut with 3.5” arrow die. Add to pink design paper. Stamp bow from Sugarspun cupcake stamp on blue card stock with Jet Black. Die cut with coordinating die. Add to arrow. Add this completed piece to card. Add Stickles to bow. Stamp numbers on pink card stock with Versamark and emboss with Clear embossing powder. Die cut with coordinating die. Add ‘16’ to cupcakes. Two beautiful projects Sarah! Love your card and your cupcake looks like a beautiful painting!